Photo courtesy of the Missouri Valley Conference Basketball twitter handle (@ValleyHoops). The last real obsticle in the Wichita State Shockers' way to 18-0 fell like a domino this afternoon as Fred VanVleet netted a career-high 32 points in the victory. EVANSVILLE, INDIANA---A record crowd of 10,034 packed the Ford Center primarily purple and orange for today's showdown between the 22nd ranked Wichita State Shockers and the Evansville Purple Aces. Unfortunately though, the crowd didn't matter. Despite the crowd whole heartedly desiring Evansville to supply the first blemish to Wichita State's conference record, the Shockers showed why they are currently the best in the Missouri Valley Conference by making the conference's leading scorer D.J Balentine a no-factor in addition to getting whatever shot they desired from floor general Fred VanVleet. Showing their skill and ability from the get-go, notorious Wichita State ran out to an 8-3 lead before the first media timeout thanks to an early four of "star senior" Ron Baker's nine points. Here we go thought the home faithful. But not to be outdone, the Purple Aces' Jaylon Brown matched the two-time All-MVC first teamer with five straight points that knotted the score at 10. From the first tie of the contest, Gregg Marshall's squad swiftly bounced back ahead while points started to become scarce at both ends. A total of 14 points were posted by both sides in the next 7 minutes (19-15 WICH)! And when the net did begin to be tickled again, it was not in favor of Evansville as "fab freshman" Markis McDuffie spurred a 15-6 end of half spurt that supplied Wichita State with a double-figures lead heading into halftime (32-21 WICH). The beginning of the second twenty minutes wouldn't be any better. Led by five of Missouri Valley Conference Preseason Player of the Year Fred VanVleet's career-high 32 points, Wichita State soared out to a 16-point advantage, causing Evansville head coach Marty Simmons to burn a timeout. Fortunately for the Purple Aces, the wake-up call temporarily served its purpose, for they were able to chip a little off of the deficit. Or that was until Conner Frankamp nailed his first jump shot of the game to drain any momentum for the home team (45-28 WICH). Just over a minute later, the Shockers would mount a game-high 20-point edge with a pair of VanVleet free throws at the 12:10 mark (48-28 WICH). The envelope and result seemed sealed. But surprisingly, it was anything but. Down but not out, Evansville utilized an 8-0 push by a pair of foreign contributors, Egidijus Mockevicius and Mislav Brzoja, to draw their group within 12 (48-36 WICH). Nevertheless, timely triples continued to be an achilles heel considering Evan Wessel followed the lull with a nailed attempt to re-up the lead to 15 prior to Frankamp (10 points) doing the exact same thing, just after the five minute mark to supply a 16-point advantage. Even when the Purple Aces gathered all their ammunition for a final charge, VanVleet drilled the final nail into the coffin, a three-pointer, with 3:10 remaining in regulation. The Shockers were on to 10-0. A freshman with the whole package, Wichita State's Markis McDuffie may have just played his best all-around game in front of NBA scouts. No, the 6'8" MVC Freshman of the Year front-runner did not net a career-high 16 points as at Missouri State or post 14 points and 7 rebounds like against Alabama at the Advocare Invitational, but he played phenomenal defense when matched-up across from the conference's leading scorer D.J. Balentine. McDuffie, who held the aforementioned superstar to a measly six points on 1-of-9 shooting when in the game during the first 34 minutes, constantly used his athleticism and length to bother the 6'2" "star senior" of the Purple Aces. In fact, if it was not for a late plethora of points by Balentine, he was in route to a season-low performance. The score was 17-15 when the Shockers' leading scorer Ron Baker picked up his second foul of the contest, and started the long walk to the end of the bench. The Ford Center was rocking as they knew Wichita State was not the same team without the shooting guard. Yeah, you're right. They were even better! 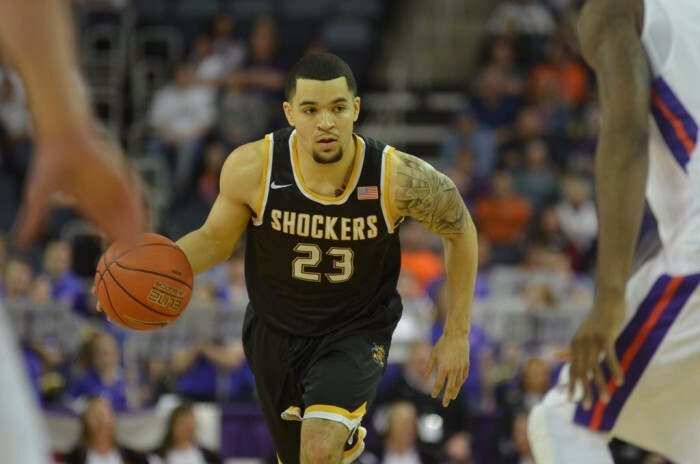 Forcing Fred VanVleet to become a score first point guard, the Shockers point total ballooned as the 2014-2015 preseason All-American drove the ball to the rim with authority, which either resulted in a foul and made free throws or a made layup. Interestingly though, "FVV" only had eight points in the first half before dropping 24 with 13 made free throws in the second. 16-5 (10-0) Wichita State will look to complete the season sweep of both their top two conference challengers when hosting Southern Illinois, who they beat like a drum earlier in Carbondale, on Wednesday. The only bright spot for the Evansville Purple Aces this afternoon was the play of 6'10" center Egidijus Mockevicius. Or maybe the more accurate term is the free throw shooting of "Iggy." Inhibited the whole forty minutes, the Lithuanian was held to only six shot attempts. However, he was fouled 6 times, for 12 free throw attempts, that he would make. For fans of Evansville, Mockevicius swishing all 12 of his charity stripe attempts is a wonderful sign. Because, he has been very inconsistent this season and actually made only 5-of-10 in Wichita earlier this month. Additionally, the leading rebounder in Division I basketball grabbed 12 rebounds. 18-5 (7-3) Evansville will look to bounce back and keep their hopes of an at-large bid alive when traveling to Cedar Falls for a matchup with Northern Iowa. In May of 2015, this journalist wrote a piece explaining how the Wichita State Shockers had already won the Missouri Valley Conference before even playing a game. Now, he, Peyton Wesner, is ready to state that the Shockers will be 18-0 heading into "Arch Madness." Moreover, one can really already consider them 18-0 because no one will get in their way. Proving the point that this team is still special without shutdown defender Tekele Cotton, Gregg Marshall's team has waltzed through the first ten games of "Valley" play. In fact, the stats of possessing a winning margin average of 20.3 points per game in MVC play and containing the opponent's leading scorer to just 13.4 points per game speak for themselves. While anything can--and will--happen March 3-6 in St. Louis, the fact is, Wichita State will be the favorite to take home the automatic bid to the NCAA Tournament when the glorious weekend arrives. VAVEL USA will supply wall-to-wall coverage from the Scottrade Center for this year's Missouri Valley Conference Men's Basketball Tournament. "That was the key to the game: Our defense. We really held them under their percentages--because their motion offense is hard to guard. Our guys were just relentless in their pursuit." ---Wichita State head coach Gregg Marshall's opening thoughts. "He (D.J. Balentine) had 18 (points). He's a great scorer, no doubt, it's proven over the years. But many of those points came late, when the game was more drive to the basket and quick threes and what not. I thought in the guts of the game, our guys, Markis McDuffie, Zach Brown, and a little bit of Fred (VanVleet) and Ron (Baker) just did a great job. And the athleticism and size that we were able to throw at him is a deterrent. He (Balentine) was not taking his normal rhythm shots. He was having to alter them many times, which that's why he was 5-for-19." ---Gregg Marshall on shutting down Evansville's D.J. Balentine and the recipe of success for containing the talented shooter. "He's good, he's really good. He plays with unbelievable savvy, basketball IQ. He just reads how you're playing in certain situations and attacks it. He's a tough matchup." ---Evansville Purple Aces' head coach Marty Simmons on Wichita State's Fred VanVleet. "No, I had a bad game. I won't personally have a game like that going forward. I'll be a lot better from here on out. That won't happen again. It's on me." ---Evansville Purple Aces' superstar D.J. Balentine on whether the defense Wichita State played affected him.